“It’s a beautiful site, isn’t it?” asked state Department of Environmental Protection Commissioner Bob Martin on Wednesday morning, pointing to a dredge boat just off Ortley Beach, the first community on Ocean County’s northern barrier island to receive replenishment sand in a $128 million federal project. Sand pumping began Monday. (See earlier story and video here.) The dredge boat will dump 267,000 cubic yards of sand that will create an approximate 125-foot-wide beach, officials said. Dredges will pump sand for approximately two weeks before moving to the Absecon Island beach and dune construction project. Work in northern Ocean County will resume in late summer, starting in Mantoloking. 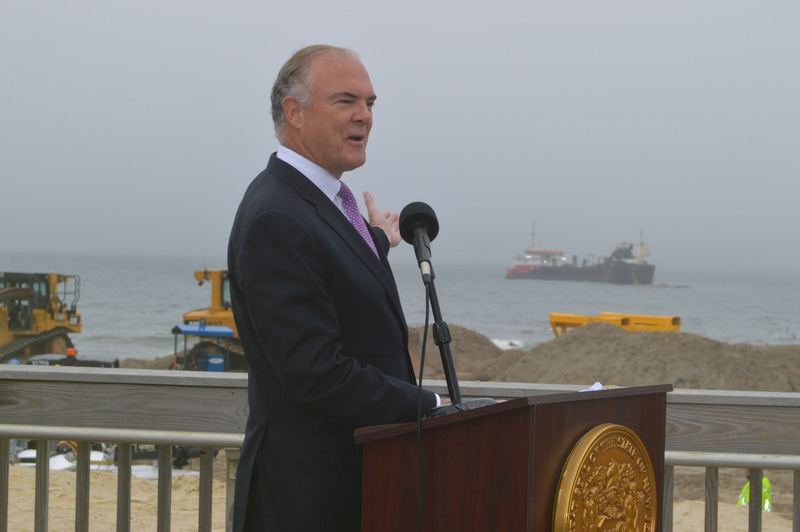 But most importantly, Martin and others said Wednesday that areas of the island not included in the initial project will still see replenishment work, including South Seaside Park, Bay Head, a portion of Mantoloking and Point Pleasant Beach. Those areas were left off the initial agreement with Weeks Marine, the government’s contractor, since oceanfront property owners have refused to sign easements allowing the work to go forward. “We will end up with a coastline in northern Ocean County of 14 miles of continuous beaches and dunes as a full coastal protection system,” said Martin. There are 128 easements that still need to be taken by condemnation if the homeowners continue to refuse to cooperate, said Martin. Thus far, the state has won every condemnation case it has brought to court in relation to the project, he said. Martin said the easements for the areas left out of the initial project should be in hand by its completion, at which point the federal government can activate several bid option clauses to have the work completed. After two dredge boats working on Ortley Beach leave the area in about two weeks after delivering the initial round of sand, they will steam toward Absecon Island, where they will work on beaches in Ventnor, Margate and Longport. That project is scheduled to last until mid-August, at which point the boats will return to the northern island and work their way from Mantoloking southward. 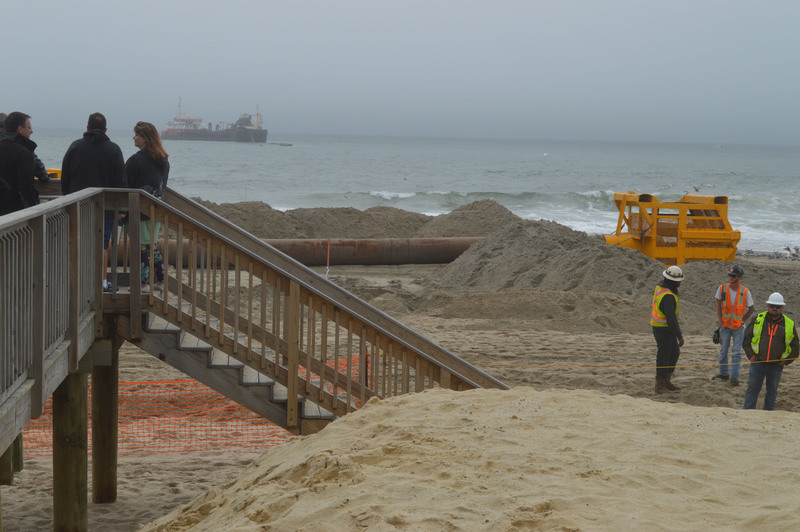 Ortley Beach residents and officials heralded the start of the replenishment project, which includes the construction of engineered dunes and beach entrances. 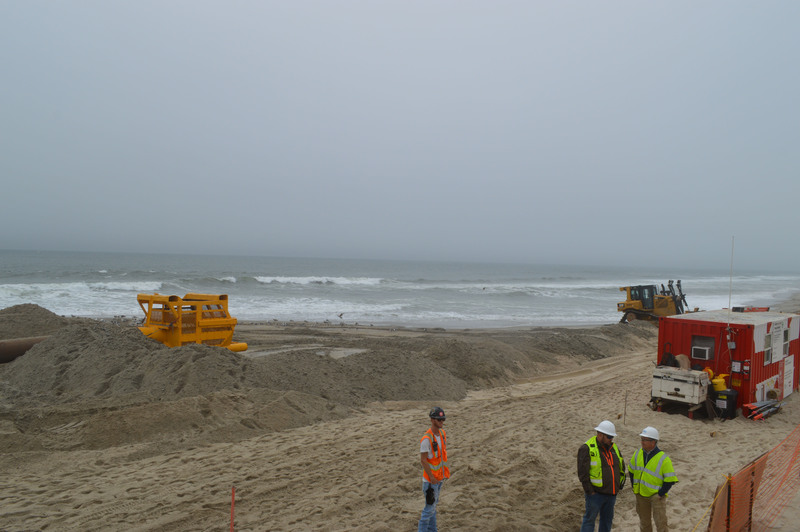 Kelaher said those who have not yet rebuilt might be spurred to do so now that a protective dune is being installed. Keith Watson, an engineer with the U.S. Army Corps of Engineers Philadelphia district, which is overseeing the project, said the dunes now being constructed on the northern island follow the identical planning blueprint of those build on Long Beach Island, which saw no breaches during Superstorm Sandy. Paul Jeffrey, of the Ortley Beach Voters and Taxpayers Association, credits local residents for helping to spur the state to fight for easements and lend its support to the project. Residents staged two marches – one that brought hundreds to Trenton, the state capital, and another where 600 people marched from Barnegat Bay to the ocean and temporarily blocked traffic on Route 35. The group, with township officials, also fought for Ortley Beach – arguably the most vulnerable location on the island post-Sandy – to receive sand first. Originally, the contractor had suggested beginning in Mantoloking and moving south.